Weather Source’s patent-pending OnPoint Platform powers all of our dynamic products and services by seamlessly managing the complexities of ingesting, cleansing, and delivering weather and climate data for business intelligence. Our system was built from the ground up by meteorologists, climatologists, statisticians, and research scientists. All data within the OnPoint Platform can be accessed via the OnPoint API or the business intelligence tool of your choice. Weather Source spent more than a decade perfecting its quality control processes to ensure your data is gap-free, easy to use, and more than 99% accurate. It can be tedious and time-intensive to manually correct for biases and inconsistencies when data is collected from numerous, disparate sources. 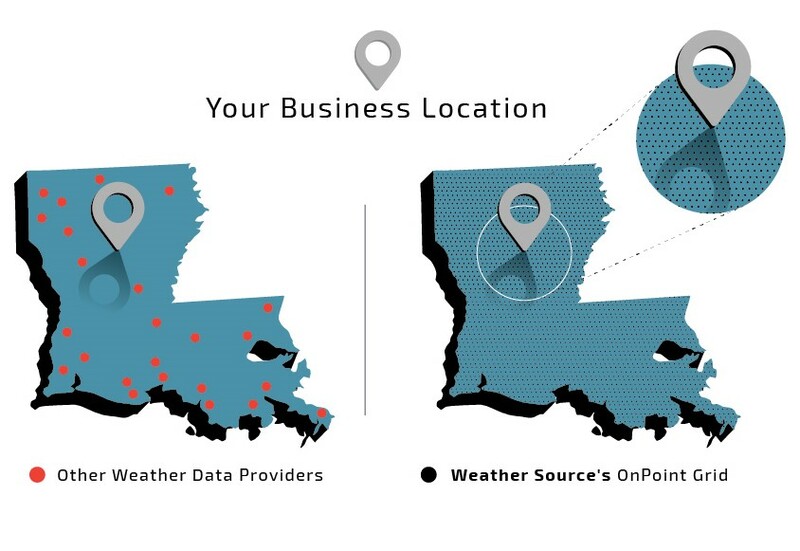 By unifying inputs within the OnPoint Platform, your weather data is homogenized and prepared for immediate analysis. The OnPoint Platform also offers an ecosystem that is inherently stable. If one data source is interrupted then remaining sources seal the gap, insulating users from inconvenient and potentially costly lapses in service. Our platform continuously ingests and processes data from thousands of U.S. and international inputs then monitors and corrects for errors. This includes a battery of tests such as observation consistency—for example, snow isn’t possible at 70°F—and comparisons against companion datasets. Missing or erroneous observations are replaced with estimates derived from surrounding data points, so you can rest assured the information you receive is accurate. Most weather data providers rely solely on airport observation station data and simple interpolation methods to extend information from those stations to your location, yet still claim their insights are “hyper-local.” This is ineffective because, among other reasons, airport observation stations are often too far from your location to provide meaningful insight. Weather Source collects its data in a markedly different way. We actually start with your exact location then ingest all of the best weather sensing technology available to reveal weather and climate insights that are perfectly tailored to your points of interest. The OnPoint Platform curates, decodes, and unifies a range of diverse inputs then stages them on its OnPoint Grid. This globally consistent, 5-kilometer grid covers every land mass in the world and up to 200 miles offshore. Each grid point in the platform—nearly 2 million in total—represents a “virtual” weather station with its own unique Weather Source ID (WSID) from which weather data can be mapped. This unparalleled, high-resolution method ensures your location of interest is never more than 1.2 miles away from a WSID—as opposed to potentially hundreds of miles away from the nearest airport observation station. When accessing the OnPoint Platform via the OnPoint API, users may request data for any lat/lon coordinate and view results interpolated from nearby WSIDs. This robust capability means businesses that leverage Weather Source have instant access to weather and climate insights for any point on Earth.